Chhath Puja 2018 Recipes | How to make thekuas and other Recies Chhath Puja | स्पेशल ठेकुआ कैसे बनाते है ? HomeHow to make thekuasChhath Puja 2018 Recipes | How to make thekuas and other Recies Chhath Puja | स्पेशल ठेकुआ कैसे बनाते है ? 1. Thekua :- ठेकुआ कैसे बनाते है ? 1. Thekua :- Chhath Puja special How to make thekuas ? 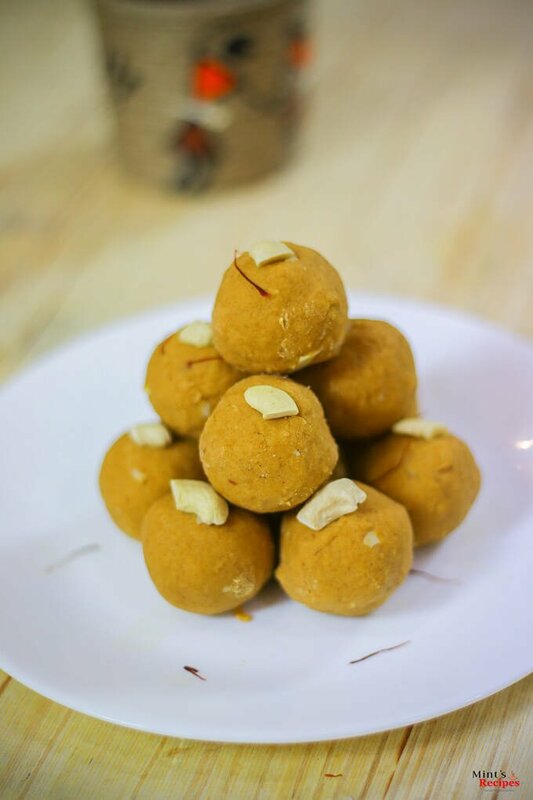 Mix wheat flour, dry coconut, fennel seeds, dry fruits, crushed cardamom and 1 tbsp of ghee in a pan. Now, make a sugar syrup by bringing water and sugar to a boil. Boil until sugar is dissolved. Add this syrup to the mixture and knead well. Be careful not to make the dough watery. The mixture should be a little wet, enough to make balls out of them. Grease your palms with ghee and take a spoonful of the mixture. Make a ball and flatten it by giving it the shape of a small disc. Form such disks out of the entire mixture and set aside. 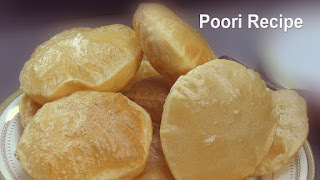 Now, heat ghee in a pan and fry the discs one by one until they are a shade darker than golden brown. Note: While thekuas remain fresh up to two weeks, it also tastes awesome when hot. You can use moulds to give the thekuas a better shape and design. If you want to avoid the sugar syrup, use dry sugar. Water can be added separately to prepare the mixture. Traditionally, jaggery is used as the sweetening agent. You can replace sugar with jaggery. Also, the amount of sugar or jaggery is adjustable to suit your taste. Make a watery solution by mixing sugar or jaggery, water & green cardamom. Add about 4 tbsp of ghee to the solution prepared and mix it to the wheat flour with chopped coconut and make dough. Take a piece of dough and make a ball. Now press it against the saancha to make thekua. Once the thekua has taken the imprint of the saancha, deep fry it in ghee till golden brown. Filter out ghee and put thekua aside. Now the thekua is ready for Chhath Puja. 2. Chaawal ki Kheer : चावल के खीर कैसे बनाते है ? Soak and wash the rice in water. Now boil the rinsed rice in milk at low flame. Stir continuously or else the rice will get sticky to the base of the pot. When the rice is cooked, add sugar and mix well. If needed add saffron or else leave it. 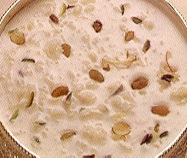 Garnish kheer with cashew nuts and raisins and serve. 3. 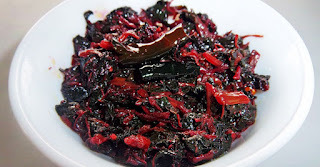 Lal Saag :- लाल साग कैसे बनाते है ? Clean the leaves, remove the hard stalks and chop the saag roughly. Heat oil in a pan; add ginger and red chilli. Saute the ingredients on medium flame for a few minutes. Now add chopped lal saag and sauté for a a couple for minutes. Turn the heat at low flame, add turmeric and add well. Now cover the lid and cook for at least 10 minutes. Keep checking in between and if found sticky and dry, add a little water. Now add salt to taste, sauté for a minute. After a few minutes take out the saag and serve hot with parathas and chapattis. 4. Kohnda or Sita Phal ki Sabjee :- कोहड़ा या सीताफल की सब्जी कैसे बनाते है ? Heat the oil in a pan, add fenugreek, asafoetida seeds and cumin seeds. When seeds start to splutter, add ginger. Now add pumpkin and green chillies, stir fry until the pumpkin becomes tender. Add salt, garam masala, turmeric, chilli powder, and cook the ingredients over medium flame. Lower the flame and stir 3-4 times until the ingredients become tender. Now add amchoor powder and cook for a few minutes. 5. Green Chana :- चना कैसे बनाते है ? 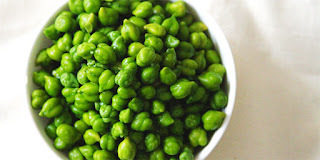 This simple Chhath Puja recipe is prepared after soaking green chana overnight. It is then sautéed in ghee, cumin seeds and green chillies and served with puris and rasiyaw or rice kheer. 6. Kasar ka ladoo :- केशर का लड्डू कैसे बनाते है ? 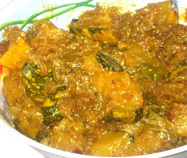 Kasar is a famous Bihari recipe made during Chhath Puja festival. This easy-to-make dish is best consumed during the winter season as the combination of powdered rice and jaggery keeps the body warm. 7. Puris :- पूरी कैसे बनाते है ?